TEACH Rwanda intends to gradually evolve into an all-Rwandan NGO, so we actively mentor our staff and identify other Rwandans who can move the organization into the country’s compelling future. Only those schools that have a TEACH Rwanda record of continuous quality improvements are awarded this status. 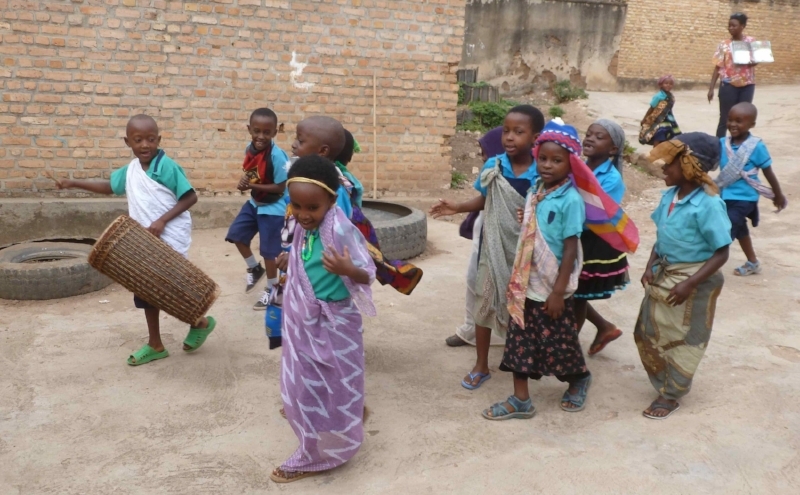 These schools then become sites for teachers from around the country—and around the world—to discover how international best practices can be implemented in ways that demonstrate respect for Rwandan culture AND reflect current child development research. Our teachers are dedicated, enthusiastic professionals who continue to learn as TEACH Rwanda volunteers mentor them. Many arrived at early childhood education through other fields, found their work rewarding, and are becoming TEACH Rwanda leaders themselves—TEACH Rwanda’s Finance Officer, Bright School’s Head Master, and our Teacher Mentor all began in TEACH Rwanda classrooms! What about the children? They are thriving! Then rush into school each day and are filled with joy! 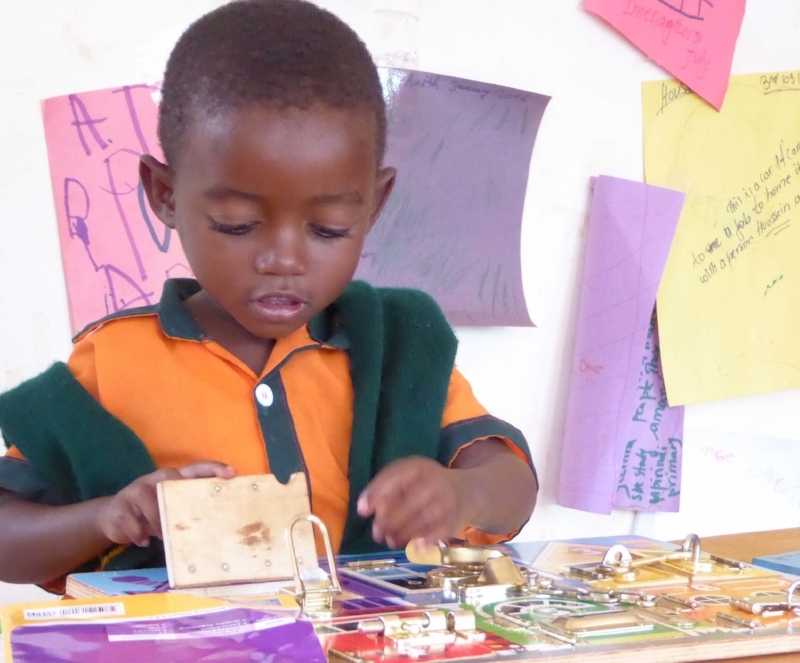 Their elaborate block constructions, intricate drawings, detailed stories, delightful pretend play scenarios, and engagement in reenacting children’s literature reveal how a Rwandan, integrated, competency-based curriculum is succeeding! And the parents? They are thrilled! And recognize what a difference TEACH Rwanda has made in their children’s lives. Parents frequently tell us that neighbors’ children who are far older do not have the skills that children in TEACH Rwanda schools have: cognitive, language/literacy, math, physical, social, and personal. “What are you doing to my daughter?” asked the father of a girl in P1. “At home every day she is writing, organizing things, doing calculation in math: addition, subtraction. She’s independent.” The journals he got for her to write in are full. “She is like a genius!" Our flagship school was founded in 2012 by Louise Batamuriza, a Rwandan teacher who retired in 2016. Bright School has expanded every year. In response to parent demand and TEACH Rwanda’s dedication to provide continuity of education, our first primary 1 class started in 2016. Each year, we will add another primary level through P6. Bright School began in a small rented house, moved to a bit larger house with better ventilation, and is poised to move into a permanent home in 2018. TEACH Rwanda now operates four bustling preschool classes as well as Primary 1 & 2 and 3 (first through third grades) at Bright School. Children from all walks of life attend, from the wealthy to the most vulnerable. Children read books, write original stories in their journals, solve math problems when they build with blocks, and discover scientific principles when they play in sand and water. It attracts international visitors, government officials, researchers, other NGOs, and Rwandan educators—they amazed to see children at Bright write stories at an age when most children in Rwanda are still learning to spell their names. To arrange a visit please contact us. The Rwinkwavu Community Library and Learning Center is home to one preschool classroom with morning and afternoon sessions. Jean d’Amour Ndizeye, the lead teacher, started working with TEACH Rwanda in 2013, and began teaching at the library in 2015. With a new facility and strong library leadership, Harmony School quickly moved from Project School status to Exemplary School status. Rwinkwavu is a small village on the road to Akagera National Wildlife Park. Although zebra, elephants, lions, giraffes, and baboons live just minutes away, few children or teachers in this low-income area ever have the opportunity to see them. Goats, cows, and chickens, on the other hand, are part of their lives. Teachers, especially those who live in Rwanda’s Eastern Province, and visitors to the library, find a remarkable, lively, modern classroom on site! 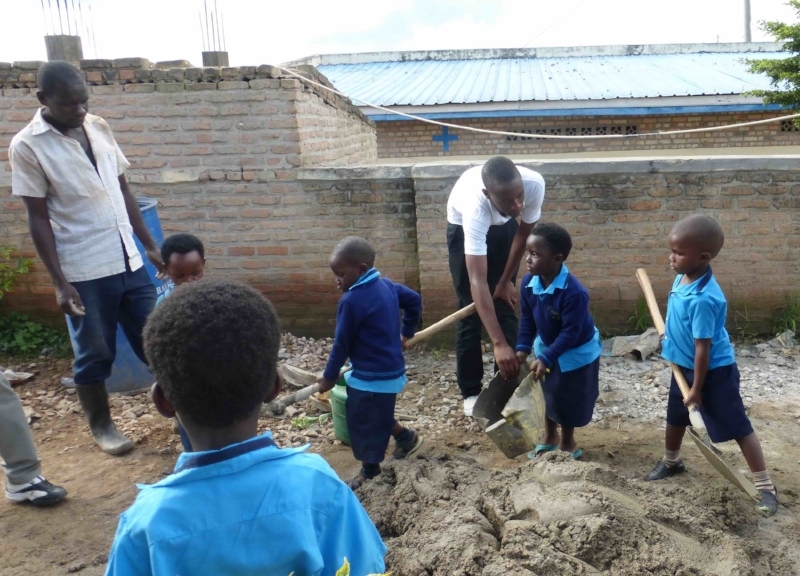 When partnership opportunities present themselves—and funding can be found—TEACH Rwanda will continue to expand its network of Project Schools, who are destined to become Exemplary Schools. This public school, located in an impoverished area just outside of the nation’s capital, opened its doors in March 2016 after months of planning. Damascene, the first Head Master, and his staff have worked diligently to learn new teaching strategies and set up their classrooms, which are so different than anything they have ever experienced. These teachers are creative and passionate about their work. But, in accordance with government policy, they are NOT paid. Few parents in this community—where there is no water, no jobs, no industry, not even a market—have the means to pay their children’s tuition. In Rwanda, public preschool teachers are NOT paid unless parents can do so. As a consequence, Kigabiro Brilliant School teachers have no salary and no benefits. They, and their families, are hungry. There is no electricity. Children in the school are hungry. An accessible source of water was found 5 months after the school opened. But the water is not drinkable, the drainage system from the roof into tanks is often vandalized, and during dry seasons the water is not replenished. Advocacy efforts are underway. Rwanda may begin to pay a few public preschool teachers’ salaries, and we are advocating that Kigabiro Brilliant School be among those selected because of the high number of vulnerable families. A supply of porridge donated by Africa Improved Foods and prepared by parent volunteers, assures that children and teachers have something to eat each day at school. The area’s population is changing, so more families may pay school fees in the future. 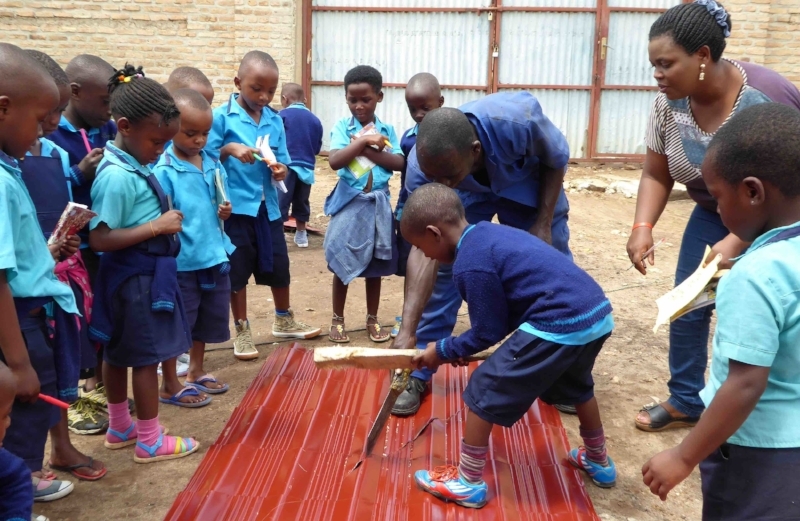 In 2018, one classroom of 3-year-old children at a private school in Kigali became TEACH Rwanda’s first project school in the heart of Rwanda’s capital city. This delightful classroom is equipped with books, blocks, dolls, washable markers, and other learning materials. Administrators and teachers are beginning their journey toward modern, child-centered education. Teacher Mentor Leonce, as well as Bright School preschool teachers, are coaching Jane and Brenda to gain new, encouraging skills as they interact with young children. What do visitors to Bright School tell us? “I would like to thank you very much and the rest of the TEACH Rwanda team for a very eye opening and exciting volunteer experience. It was such a great honor and privilege being given the opportunity to see first-hand the thankless job and work that you do to ensure a bright future and access to adequate opportunities for Rwandan children from all backgrounds and walks of life. It amazed me to see young 3- to 6-year-olds being able to count, read and write in multiple languages all at the same time. It touched me so dearly because it reminded me of the similar opportunities and privileges that I was so lucky to have growing up. However, it was also a reminder that not all children are afforded the same chances in life, and to know that the majority of the kids in your schools are financially supported shows how dedicated TEACH Rwanda is in ensuring that children--regardless of where they are from and what they can afford--are granted their right to an good education. Your unique teaching style, one that hones in on each kid’s learning and development pace, sets a good example for what education in Rwanda and the rest of the world should look like. Easy would be the last word to describe the work that you so passionately do. The process of trying to help teachers unlearn traditional teaching and learning methods and adopt more collaborative and open methods was and still is one of the toughest things I experienced during my time with you, but I was reassured and my hope was restored when I saw the patience that TEACH Rwanda teachers applied in their classrooms and among each other. It would be an understatement to say I thoroughly enjoyed all the time I was able to spend with the kids both in Muhanga and Kigali. The joy and brilliance they exude are only a reflection of the wonderful job that the team has done in instilling confidence and individuality in the classroom. Their stories of personal hardship and poverty don’t seem to hinder their ability to come alive in the classroom and very quickly find their place among each other. Clare—Thank you for the visit to your lovely school—the children were very friendly and clearly love learning. Kylie—Fabulous reading by P2 and great information by teachers. Thank you. Rhea—All of the children were very friendly! Amazing school. Kathy—You have such an amazing learning ethos for the children. Mairead—You are doing amazing work with these children and they all seem so happy. Laurie—Wonderful projects! Your teachers are patient and joyful—a pleasure to meet. Learning is so much fun here. Hannah—As a drama teacher, it is wonderful to see the students using their imaginations & creativity so freely and being encouraged to do so. Imogen—The enthusiasm and resilience of the students is amazing. Ruth—This school is so full of joy! Jo—It has been an absolute pleasure watching how much the children love learning and how adored they are by all who work with them. Michael—Many thanks for allowing us an insight into your excellent and inspirational practice. Keep up the good work. The children are a credit to you. Izzy—It was a priviledge to see your excellent practice. Danielle—Your school is very inspirational. Rachel—Wow! What an amazing school you have! Truly incredible work! Alex—This school is wonderful, thank you for hosting us today. It has been a fantastic experience. I hope the school continues to go from strength to strength. I wish to express my deep heartfelt sincere appreciation for your reception, care, humility and a spirit of love you with your entire staff you showed me while at your school. This being evident in the way you took time to orient me about Bright School and TEACH Rwanda ethos. I was so humbled. About the teaching and learning, it was spectacular watching children take a lead in their learning process, at such a tender age of 3 children developing remarkable competencies like decision making, self-direction (responsibility and accountability (a little boy who carried a basinful of cups on his head),literacy and numeracy developed at the same time at the child's own pace, communication skills (at a tender age, learners making presentations of their master pieces), home economics too (P2--vegetables), and task accomplishment. I also enjoyed the commitment of your staff. Each one of them was naturally driven to work with children. This I believe strongly positively affects the teacher-learner relationship, hence creating a significant impact to the learning of the Little Angels. Am working on my learning plan now. I have set tomorrow to conduct a model lesson, putting into account all the good practices I observed before I conduct a general model lesson for other teachers. I intend to report to the entire staff my findings practically through my model lesson in P5 class then give them a chance to evaluate me comparing the past Ibrah's class and the current one. TEACH Rwanda maintains high standards for all of its schools.